This two-story home is ideal for families to share or for a few couples. The bedrooms are spread out over both levels, and there’s tons of space outside to relax. You’ll be steps from the water, and minutes away from golf, a spa, horseback riding, tennis, and tons of water sports. La Serena is in Punta Cana Resort, which has an ecological reserve with walking trails and 12 natural springs. There’s something for everyone here, perfect for any group of travelers. The perfect getaway in the gated community of Punta Cana Resort! La Serena is inside Punta Cana Resort, a lush, gated community right along the Dominican Republic coast. 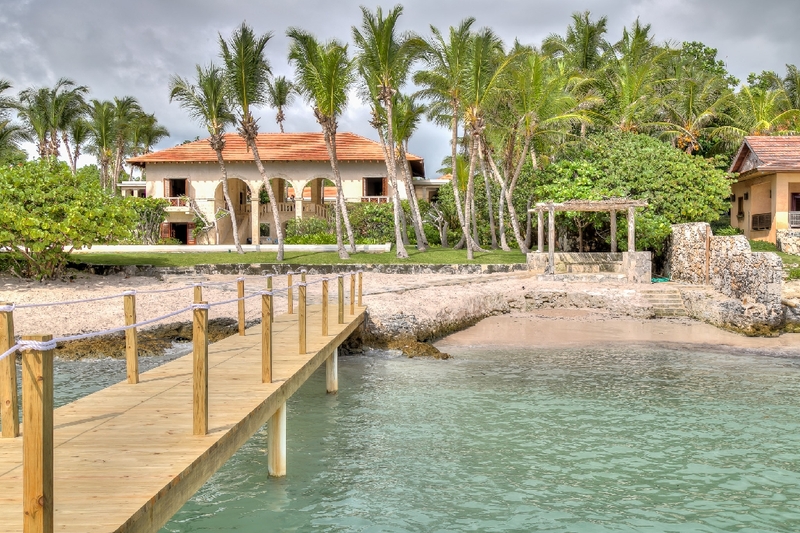 This resort offers guests golf, water sports, tennis, SCUBA, snorkeling, horseback riding, and an ecological reserve. This beachfront villa has a private boat dock, so guests can take a paddle board on the water to explore. There’s also a large lap pool to swim in, loungers to sunbathe on, and umbrellas to read under. The villa surrounds an elegant courtyard, bordered by high stone arches and terra cotta roof tiles that add warmth. The foyer has two regal staircases on either side, and faces the back terrace. The large living room has a flat screen TV, cathedral ceilings with exposed beams, and several places to rest and relax with family. The gourmet kitchen is fully equipped with stainless steel appliances, a gas stovetop with hood, a wine cooler, and a china cabinet. After cooking, feast in the formal dining room for an opulent meal with an ocean view. On the main level, the master bedroom has a king-sized bed, TV, walk-in closet, and ensuite bathroom. The bathroom has a double vanity and soaking tub. Both of the queen suites on this level have walk-in closets, TVs, and ensuite bathrooms as well. Their ensuite bathrooms have one vanity and a tub. The fourth bedroom has two queen-sized beds, a walk-in closet, TV, and an ensuite bathroom. Upstairs, guests will find four more bedrooms and a spacious balcony with ample seating. Two families could stay in the upper level, as both wings have a queen suite and twin suite that share a bathroom. La Serena is near a spa, several restaurants, and the Westin Resort. Punta Cana Resort also has a cigar bar, fully equipped gym, and natural springs, so any guest can find something to do. Car rental, grocery and beverage shopping (pre-arrival and during your stay), liquor and wine delivery, nanny service, baby equipment, spa services, golf carts, yoga and personal training, and photography can be arranged for an additional fee.